Universe is launching the world’s first intranet application for Google Apps. The new app completes the Google Apps ecosystem for enterprises and challenges the position of Microsoft Office 365 in business collaboration. “Google Apps with Universe is now the number one SaaS solution available for enterprises”, said Peter Vesterbacka, Mighty Eagle of Rovio and an advisor to Universe. Universe today launched the world’s first intranet application for Google Apps. Introduced in Google TeamWork meeting, the new app completes the Google Apps ecosystem for enterprises and challenges the position of Microsoft Office 365 in business collaboration. The Finnish startup already has impressive clients like Rovio, maker of Angry Birds, which is currently implementing Universe. The Finnish Broadcasting Company Yle implemented Universe to its 3 500 employee organisation almost a year ago. Universe is now working on a funding round to expand its operations, support, sales, and marketing. Universe is designed to meet the collaboration needs of a modern enterprise in a cloud environment. It offers an agile and user-centric platform for internal communication and collaboration. Universe completes the Google Apps for Work ecosystem by addressing a well-known and crucial pain point - a need for an intranet that is designed to work seamlessly with all enterprise applications. “We already have a strong foothold within Google Apps users in the Nordics. Most startups don’t get to tackle existing problems, but we know there is a demand for this and before the launch we already had 50 000 potential users lined up”, said Vesa Sironen, co-founder of Universe. The company is located in the world’s two top startup capitals San Francisco, CA, and Helsinki, Finland. The app will be available online at getuniverse.com and through the Google for Work partner program. Universe is a Finnish startup. It’s first product is an intranet application for the Google ecosystem. The application is first of its kind and developed for the needs of large enterprises. Universe is a ready to use app and fully integratable with other Google Apps. Universe offices are located in Helsinki, Finland and San Francisco, CA. 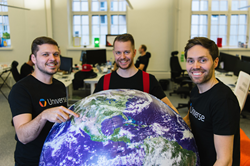 The three founders of Universe, Perttu Ojansuu, Vesa Sironen and Antero Hanhirova, have been in the Google service business since 2010. Due to this, Universe already has a strong foothold in the Nordics with enterprise customers like The Finnish Broadcasting Company Yle, and Rovio the Angry Birds company.